Grrrr....blogger is being a pain and this is my 3rd attempt at this post!! 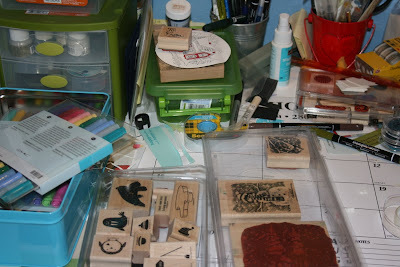 Ok, back to business.....this week I am again playing along with the Stamping Ground blog and posting pics of my work space. It actually isnt too bad this week. I had just finished up a card when I snapped these pics. This pic shows the 2 sets I was debating for my Christmas card. I ended up using the one on the right. The stamps for my Halloween card are there in the top right corner and the makings of another Christmas card are on top of a green container,above the SU stamps. 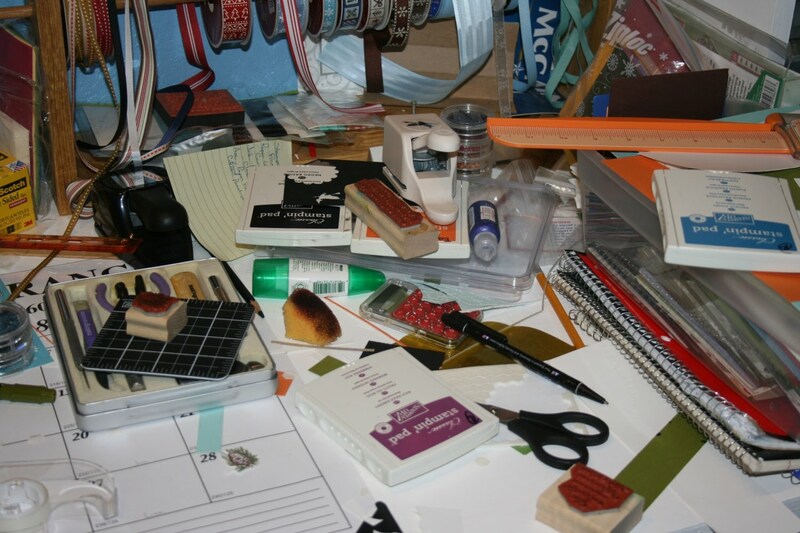 You're a very busy crafter. Some really fab stash to snoop round there today. Nice desk and thanks for the late peek! AWWW I love a good mess like that! Wow. I haven't even thought about Halloween, much less Christmas. Great way to be ahead of the game. I'm really sorry I'm late this week, but I got caught up in real life issues and failed to get here sooner. I'm still digging that ribbon holder. Yep, I'm the one lusting for it. Happy belated WOYWW. What a busy desk, looks like you've been having fun! 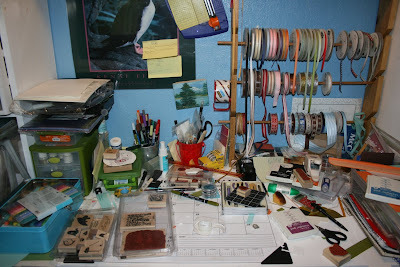 Sorry I'm a bit late in getting to your blog... but what a fabulous desk! Soooooo many crafty goodies there - your ribbon storage is a wonderful idea!